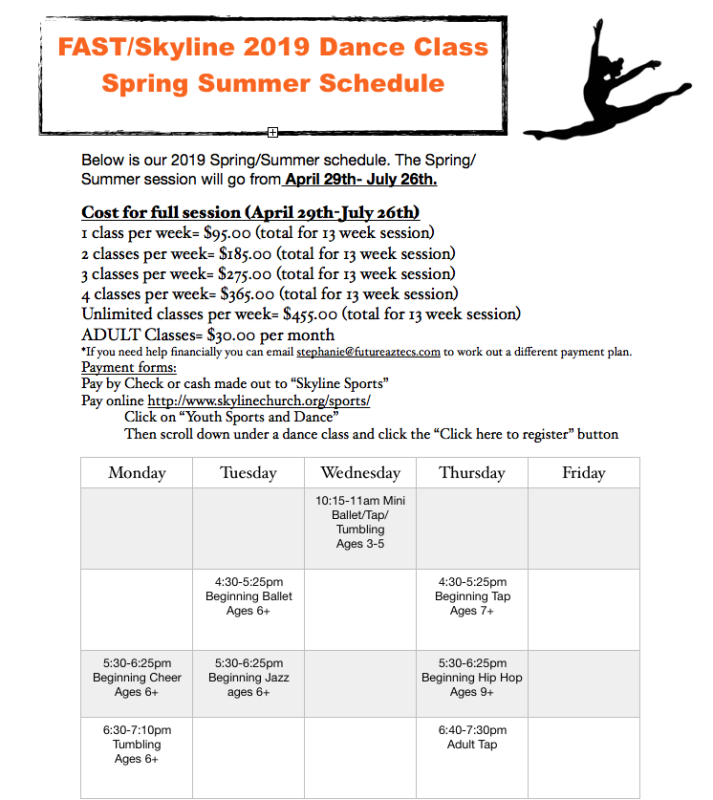 Spring/Summer Recital Session sign ups now OPEN! Join us April 29th-July 26th for our Spring/Summer Recital session. This session will culminate with a Recital!! ​ To join in on the fun, all you have to do is click here to sign up! Below is our class schedule. Future Aztecs Cheer and Dance is a program that incorporates quality coaching with modest choreography, costuming and music. Character development lessons are periodically incorporated into our practices, where the girls learn about loving others, respect, kindness, and generosity to name a few. We have a Winter Showcase in December and a Recital in July. Our goal at F.A.S.T. is to create programs that not only grow the kids athletically but that grow them in their attitude about school and life as well. We also believe in offering quality coaching that anyone can afford no matter where they come from. Classes are paid by Session not by month. ** The fee is a one time payment for all 13 weeks. For those who need assistance financially, we offer up to %50 scholarships and the option of paying monthly. Recital will be the week of July 22nd. Time/day TBD. Recital fee is $50.00 per class which covers costume and all other recital related fees.